Australian five-piece jazz/folk band from Melbourne, whose influences come from 1920's jazz, Gypsy brass, English folk and Trinidadian Calypso. 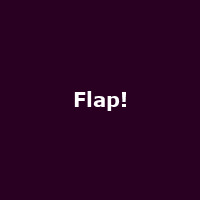 Flap! are a good times party band made up of talented musicians. Jess Guille's vocals are honey-sweet, while Eamon McNelis' trumpet playing is a riot of colour and rhythm. The band released their self-titled album in 2008 followed by 'A Great Day for the Race' in 2012.